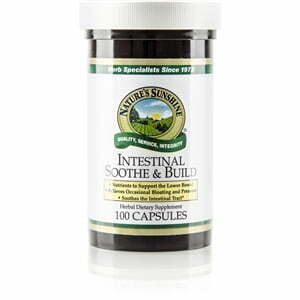 Intestinal Soothe and Build is now available again and shipping immediately! Nature’s Sunshine Intestinal Soothe and Build nourishes the lower bowel with ingredients that provide soothing effects and that alleviate occasional bloating. Intestinal Sooth and Build stimulates a healthy balance of intestinal flora to assist in the digestion of nutrients. This formula supports the natural cleaning processes of the bowel to keep food moving through the digestive system.